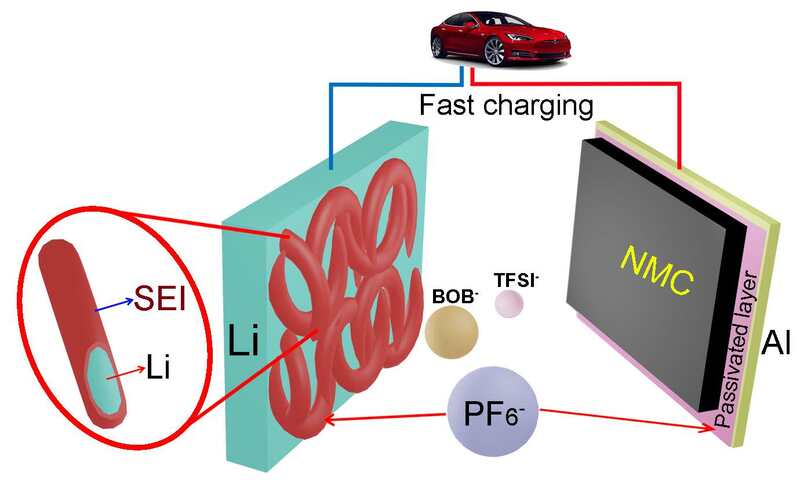 An artist's illustration shows how PNNL's addition of the chemical lithium hexafluorophosphate to a dual-salt, carbonate solvent-based electrolyte makes rechargeable lithium-metal batteries stable, charge quickly, have a high voltage, and go longer in between charges. PNNL researcher Wu Xu is a lead author on a Nature Energy paper that describes how adding a pinch of chemical additive to a lithium-metal battery's electrolyte helps make rechargeable batteries that are stable, charge quickly, and go longer in between charges. RICHLAND, Wash. — Scientists have found adding a pinch of something new to a battery's electrolyte gives the energy storage devices more juice per charge than today's commonly used rechargeable batteries. New, early-stage research shows adding a small amount of the chemical lithium hexafluorophosphate to a dual-salt, carbonate solvent-based electrolyte can make rechargeable lithium-metal batteries stable, charge quickly and have a high voltage. "A good lithium-metal battery will have the same lifespan as the lithium-ion batteries that power today's electric cars and consumer electric devices, but also store more energy so we can drive longer in between charges," said chemist Wu Xu of the Department of Energy’s Pacific Northwest National Laboratory. 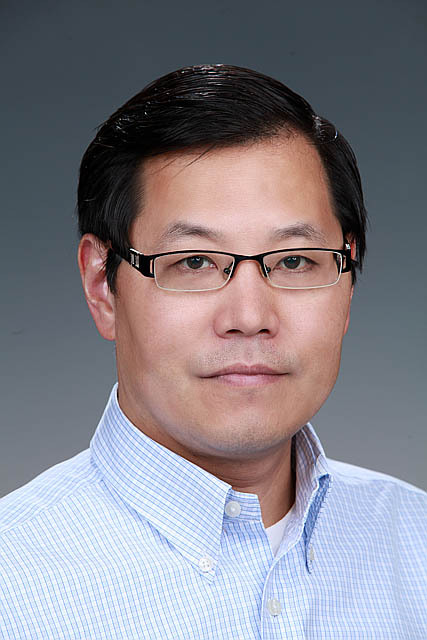 Xu is a corresponding author on a paper published today in the journal Nature Energy. Most of the rechargeable batteries used today are lithium-ion batteries, which have two electrodes: one that's positively charged and contains lithium, and another negative one that's typically made of graphite. Electricity is generated when electrons flow through a wire that connects the two. To control the electrons, positively charged lithium atoms shuttle from one electrode to the other through another path, the electrolyte solution in which the electrodes sit. But graphite can't store much energy, limiting the amount of energy a lithium-ion battery can provide smart phones and electric vehicles. When lithium-based rechargeable batteries were first developed in the 1970s, researchers used lithium metal for the negative electrode, called an anode. Lithium was chosen because it has ten times more energy storage capacity than graphite. Problem was, the lithium-carrying electrolyte reacted with the lithium anode. This caused microscopic lithium nanoparticles and branches called dendrites to grow on the anode surface, and led the early batteries to fail. Many have tweaked rechargeable batteries over the years in an attempt to resolve the dendrite problem. Researchers switched to other materials such as graphite for the anode. Scientists have also coated anodes with protective layers, while others have created electrolyte additives. Some solutions eliminated dendrites but also resulted in impractical batteries with little power. Other methods only slowed, but didn't stop, dendrite growth. Thinking today's rechargeable lithium-ion batteries with graphite anodes could be near their peak energy capacity, PNNL is taking another look at the older design with lithium metal as an anode. Xu and colleagues were part of earlier PNNL research seeking a better-performing electrolyte. The electrolytes they tried produced either a battery that didn't have problematic dendrites and was super-efficient but charged very slowly and couldn't work in higher-voltage batteries, or a faster-charging battery that was unstable and had low voltages. Next, they tried adding small amounts of a salt that's already used in lithium-ion batteries, lithium hexafluorophosphate, to their fast-charging electrolyte. They paired the newly juiced-up electrolyte with a lithium anode and a lithium nickel manganese cobalt oxide cathode. It turned out to be a winning combination, resulting in a fast, efficient, high-voltage battery. The additive enabled a 4.3-volt battery that retained more than 97 percent of its initial charge after 500 repeated charges and discharges, while carrying 1.75 milliAmps of electrical current per square centimeter of area. It took the battery about one hour to fully charge. The battery performed well largely because the additive helps create a robust protective layer of carbonate polymers on the battery's lithium anode. This thin layer prevents lithium from being used up in unwanted side reactions, which can kill a battery. And, because the additive is already an established component of lithium-ion batteries, it's readily available and relatively inexpensive. The small amounts needed — just 0. 6 percent of the electrolyte by weight — should also further lower the electrolyte's cost. Xu and his team continue to evaluate several ways to make rechargeable lithium-metal batteries viable, including improving electrodes, separators and electrolytes. Specific next steps include making and testing larger quantities of their electrolyte, further improving the efficiency and capacity retention of a lithium-metal battery using their electrolyte, increasing material loading on the cathode and trying a thinner anode. This research was supported by the Department of Energy's Office of Energy Efficiency and Renewable Energy. Researchers performed microscopy and spectroscopy characterizations of battery materials at EMSL, the Environmental Molecular Sciences Laboratory, a DOE Office of Science national User Facility at PNNL. The battery electrodes were made at DOE's Cell Analysis, Modeling, and Prototyping Facility at Argonne National Laboratory. Reference: Jianming Zheng, Mark H. Engelhard, Donghai Mei, Shuhong Jiao, Bryant J. Polzin, Ji-Guang Zhang & Wu Xu, "Electrolyte Additive Enabled Fast Charging and Stable Cycling Lithium Metal Batteries," Nature Energy, March 1, 2017, DOI: 10.1038/nenergy.2017.12.